Today, a group of researchers from the Centre for Permafrost (CENPERM) from the University of Copenhagen publish in an article in Nature about the growth of deltas in Greenland. The work is essential for Bendixen’s recently finished PhD project at CENPERM and has been carried out in close collaboration with Lars Lønsmann Iversen, who has been responsible for the statistical computing. Post-doc Mette Bendixen from Centre for Permafrost (CENPERM) and Lars L. Iversen from the Freshwater Biological Laboratory show how climate change is affecting the Arctic landscape, causing the Greenlandic deltas to grow. Deltas are important eco systems for both agriculture and fishing, but most of the deltas in the world are drowning due to a rise in the global sea level. The researchers from the University of Copenhagen have collaborated with a team of Danish, American and Greenlandic researchers. “We examined 121 deltas by looking at historical aerial photos taken by the American army during the Second World War. We compared these with modern satellite photos. In this way, we have been able to track changes in the Greenland deltas and see what has happened over the last 75 years,” explains Postdoc Mette Bendixen. 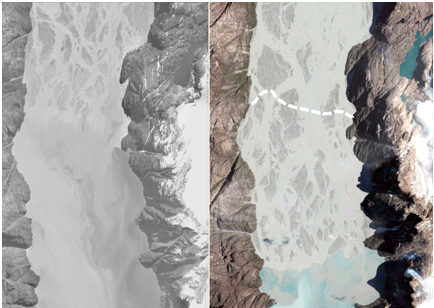 The photo on the left shows a delta in West Greenland photographed in 1985 and on the right the same delta in 2010. It clearly shows how the delta has been extended by several kilometres over this 25-year period.